Exclusive: Bill Morrison dives into Titan Comics' new The Beatles: Yellow Submarine graphic novel . Beatles Radio: The Beatles, Solos, Covers, Birthdays, News The Fab 4 and More! You might think you reside in a sweet pad, but it pales in comparison to the banana-colored submersible that the mop-topped lads from Liverpool call home in the classic Beatles tune "Yellow Submarine." The whimsical ballad was written by Paul McCartney and John Lennon, memorably sung by drummer Ringo Starr, and appeared on their 1966 album Revolver. 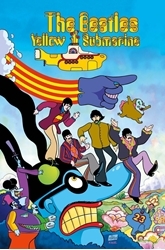 To capitalize on the song's fantasy narrative and immense popularity, an iconic animated feature was produced using a kaleidoscopic palette of vivid colors and crazy characters (like Blue Meanies, Apple Bonkers, Snapping Turks, Old Fred, and of course the Dreadful Flying Glove) in a trance-like odyssey starring John, Paul, George, and Ringo.